[prMac.com] Sydney, Australia - Acapela Group and AssistiveWare(R) B.V. are proud to unveil that the first ever genuine, natural-sounding Australian children's voices are now available in Proloquo2Go, a text-to-speech app for iPhone, iPod touch and iPad designed to provide a voice for children who cannot speak. To complete the family today Proloquo2Go is also introducing Lisa, a new adult Australian female voice. "The new Australian children's voices will finally enable our children without speech to talk like their friends. Having an age appropriate voice, which not only speaks with an Australian accent but also provides children with access to the Aussie vocabulary, will have a positive impact on their social and communication development - in more ways than we can imagine. I look forward to hearing lots of happy little Vegemites using these voices in homes, shops, schools and the great outdoors!," said Jane Farrall, Speech Pathologist and Special Educator. Proloquo2Go already provides a voice to over 50,000 users around the world, including over 5,000 Australians. Approximately 60% of the Proloquo2Go user base is 11-years-old or younger (as young as 2-years-old), yet prior to these new voices, Australian children only had access to an adult Australian male voice. This was one of the primary motivators for creating the child voices - to have a product that more accurately represents its users. Commenting on the launch of the Australian children's voices, founder and CEO of AssistiveWare, David Niemeijer said, "Last year we introduced British and American children voices, which have already seen over 15,000 downloads and the feedback has been overwhelmingly positive. Children and their parents have credited Proloquo2Go with a major improvement in their daily communication." "Often, we hear that the cognitive and emotional skills of children are finally understood after using Proloquo2Go, where previously the child may have never been able to verbalise or express his or her thoughts. We are excited that those phrases will finally resemble the child's own voice." "This groundbreaking project is the first of its kind in the industry," said Lars-Erik Larsson, CEO of Acapela Group. "With over 2,000 hours of research, recording, processing and development, the new Australian children's voices are a fulfilling milestone and a reflection of our longtime leadership in this field." The Australian children's voices and female voice are included in the Proloquo2Go text-to-speech app for iPhone, iPod touch and iPad through a free 3.0 version update released today on the App Store. Version 3.0 also adds a number of other major features, including ExpressivePower(TM) and access for people with motor challenges who have difficulty using iPad's touch interface. After October 2013, the new Australian children voices will be available for licensing to other developers to utilise in their apps and communication devices, allowing even more children to access programs with voices that resemble their own. The collaboration between Acapela Group and AssistiveWare dates back to 2003 when AssistiveWare was the first company to build a Mac product using the natural-sounding Acapela voices. Both companies share a strong dedication to the assistive technology market and were natural partners to tackle the challenges of developing children's voices designed for people who cannot speak. Acapela Group brought decades of experience in building natural-sounding text-to-speech voices. AssistiveWare brought its experience in working with people with speech-impairments though its BETT 2011 award-winning Proloquo2Go augmentative and alternative communication app for iPhone, iPod touch and iPad. Acapela Group invents speech solutions that bring content to life through giving it a voice in up to 30 languages. More than 60 resounding synthetic, yet natural sounding voices as well as new, authentic American and British children's voices are ready to vocalize written content into a pleasant audio result. Each audio selection is authentic sounding, unique and original, presenting a distinct personality that perfectly matches different contexts. Acapela Group aims to add a subtle layer of intelligence and significantly enrich audio dimension by offering more meaning and intent to each voice. The Proloquo2Go text-to-speech application is available for $199.99 (USD) from the App Store on iPhone, iPod touch and iPad. Version 3.0 includes the new Australian female and children voices as free downloads and is available at no charge to existing users. For videos that include: a behind the scenes look at how children's voices are made, how text-to-speech works, some short interviews, and the impact Proloquo2Go and these new voices visit our web site. AssistiveWare(R), a leading innovator of assistive technology software for iOS and Mac OS X with over 125,000 customers worldwide, is committed to collaborating with the global community to make a difference in peoples lives. 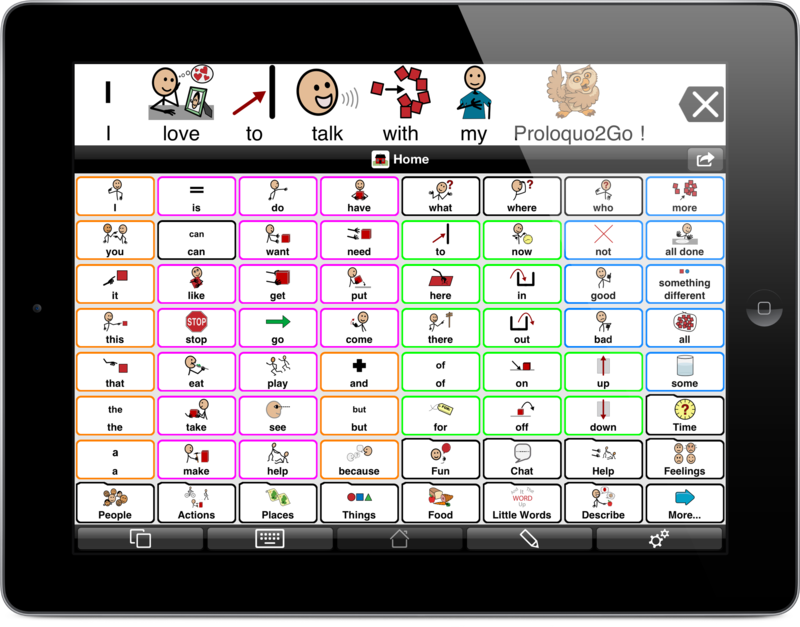 The company's flagship product, Proloquo2Go(R), is an award-winning Augmentative and Alternative Communication (AAC) application for iPad, iPhone and iPod touch that provides a "voice" for people who have difficulty speaking or cannot speak at all. AssistiveWare offers a wide-range of assistive technology products and services. All Material and Software (C) Copyright 2013 AssistiveWare B.V. All Rights Reserved. Apple, the Apple logo, iPhone, iPod and iPad are registered trademarks of Apple Inc. in the U.S. and/or other countries. Other trademarks and registered trademarks may be the property of their respective owners.